> StelliFer Laboratories: the tuners and tweakers among the shipbuilding companies, their SFs16 Wendigo gunships (ToDo: Quests). –Weapons + 14 new sounds (adding weapon icons inspired by Vizth's More Dakka mod, adding sounds by Aeonic's Turbolaser mod). +includes improved versions of SFSpaceStations, Stargate Dock&Go. Please use vanilla 1.03 to test bugs/features etc. as this mod hasn't been cross-tested. Just SFItemGraphics alone are OK, though. GReat mod! (yes i'm new so i'm hoping to get the programm from my twin to mod...) ANYWAY~!!! The ship is great, the graphics add veriety to it [the game] and i love the armor's very nice job! :D but one problem... i think the ship might be a tad larger then most considering it's speed and turning, but it's a great ship other then that! so a resize would be nice. anyway thats it, Az out. More weapon graphics are underway. I'm making them slowly as I go along the game. I've estimated 80 icons for all vanilla weapons, so it may take some time. As for the SFs30, it's still a draft version I've made somewhat smaller than a Charon Frigate (just under 100px) as it's supposed to be a one-man Corvette class. I'm planning to make more variants in a future release - after I've dealt with the quests for special items and the graphic/sound part of the mod. This is a wonderful mod, full of new ships and new weapons. The wealth of new graphics alone is worth the download to breath a bit of fresh air into the game. 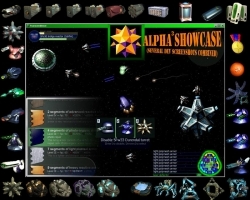 Updated to 00.6 ALPHA2 with loads of new content at 208 downloads. And again at 215 with 00.6a because somehow the main XML got corrupted with unicode garbage the last time. I've added the RK15 Partisan Turret icon. Hey i keep getting this funky message whenever i try to play it:: Error parsing Extensions\Exstentions to save\systems & Universe\794_StelliFerLaboratories\StelliFer Laboratories 006 1_03\SF StelliFer v006a 1_03: Unable to parse SF StelliFer v006a 1_03.xml: Line(2414): close tag does not match open :: anyideas what's up? I also got a few errors with Images a while back when i downloaded the 3rd (current) update. Re: the current problem with 006a, thanks for the warning. I need to clean up the next update and then I'll repost. Reuploaded 00.6b at 357 downloads to fix the typo. Added Cnidocyst icon and soundFX (and 2 more SFX). Azmond, I don't get this problem missiles showing on the left: in the itempicker? Maybe we should continue in the forum? I actually haven't gotten onto the forum yet, and i haven't been able to get on computer but i'll make an account. It'll be azmond again. And by i haven't been able to get on. i mean, i've been busy in life. 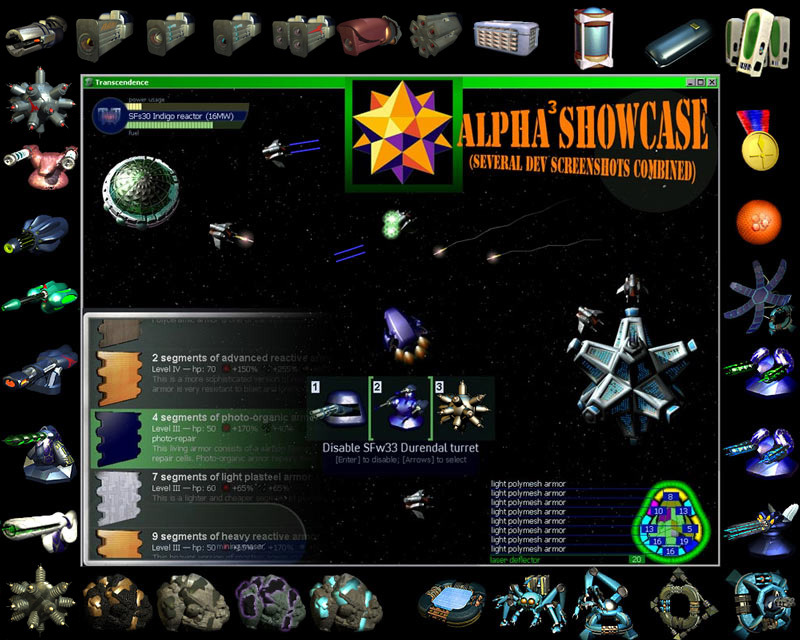 Version 00.7 Alpha3 updated at 573 downloads, mostly for SFItemGraphics. Adds shields, weapon icons, sounds. Almost all weapons/shields/launchers are overwritten with new or placeholder icons. New sounds have been assigned for particle/ion/plasma/positron/antimatter weapons. Check included readme for more info. MGgamer, please only use Transcendence 1.03 with this mod. Very nice! I love the graphics that you have come up with. Adds much more spice to this great game. PLEASE UPDATE THIS for 1.07++!!! I'm adding this to my extensively multi-modded game piecemeal. Great graphics! The different colors/images for ores and consumables should be a stand-alone mod. Man, your mods are amazing!